This film is awful. Just bloody awful. The acting is atrocious, the writing worse, and the virtually identical heavy metal music during every action seen is outright bizarre. Ron Jeremy’s cameo is slightly amusing, in that it is almost entirely comprised of him wandering around the woods alone yelling, “hello, anybody out there?” but other than that this film is an all-out dud. So, if we watch this with the same critical eye as the average stag film and forgive the acting, plot, lighting, music, direction, costume consistency (indeed, there’s at least one scene where a girl’s outfit changes back and forth between camera shots) – if we forgive virtually every aspect that goes into making a half decent film, how’s the gore? All right, I guess. Mostly just splattered blood by the bucketload, and mangled wounds that might be skin and brains, or might be oatmeal and latex. There are a few exceptions, including when Pirate Death breaks his hand through the back of a girl’s neck so it comes out her mouth, but mostly it’s nothing to write home about. If you like low budget gore, give it a go. Maybe. But otherwise there’s really no point. This entry was posted in Movies / TV and tagged horror, independent, low budget, mitch toles, ron jeremy, splatter by Bilgemunky. Bookmark the permalink. Yar. 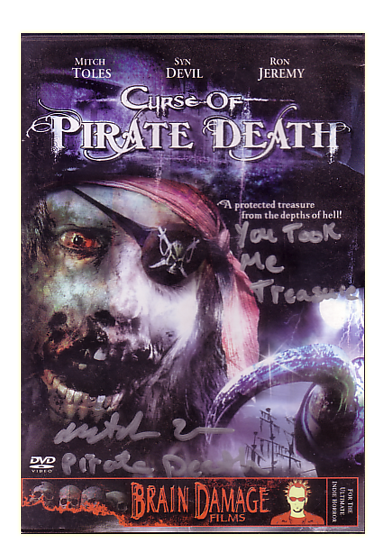 If it’s worse than all of the other pirate horror films I’ve seen over the past couple of years, it has to be bad. I think someone should run a Midnight Movie marathon somewhere featuring all of the horrible pirate horror films ever made. It could really become a cult phenomenon. Or, it could just plain hurt. More disappointing then watching is having to be in a film that nobody, director & producer included, would care or have any sense on making something worth wild. This budget was non excitant. Tring t do something is worth more then not having done it at all. If a person would spend their life not taking chances on opportunity then why bother even living. This film is rated “E” for effort.